Rachio vs RainMachine vs Skydrop: Which Smart Sprinkler Controller is Best? Smart sprinkler controllers can save you money on your water bill. But to find the best smart sprinkler controller, you’ll have to compare Rachio vs RainMachine vs Skydrop. All devices include detailed watering reports to see how much you watered and when, along with custom watering options for each zone. Sometimes things are just easier without your smart phone. Maybe your phone is charging upstairs and you just want to quickly adjust the sprinklers before you forget. On Rachio, that’s difficult since the controls are under the cover, with just a few buttons available. Skydrop has controls, but it’s also a little difficult to use since it requires a spinning dial. RainMachine wins this one for their illuminated touch keys and HD touchscreen that makes it easy to schedule either on the device or on your phone. 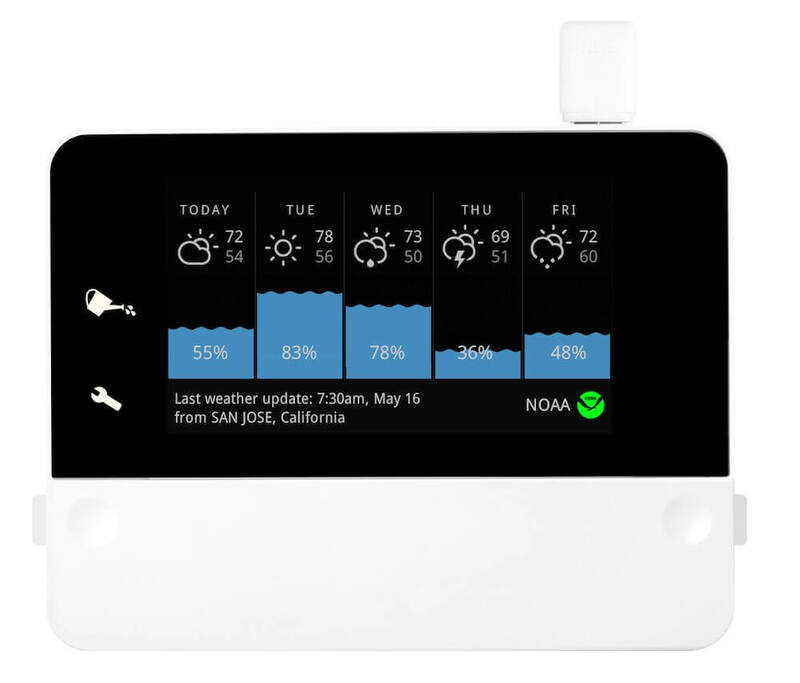 All three controllers between Rachio vs RainMachine vs Skydrop use weather data to automatically adjust your watering schedule. The controllers may also qualify for a rebate with your local water company, depending on where you live. All three controllers allow you to input soil, slope, and shade factors to improve watering. Integrates with Netatmo Personal Weather Stations for extremely accurate weather data. You can track the weather in your own backyard, and adjust watering schedules accordingly. Connects with NOAA weather service and others several times per day to keep your system accurately watered. This category is too close to call, since both Rachio and RainMachine have great water savings. 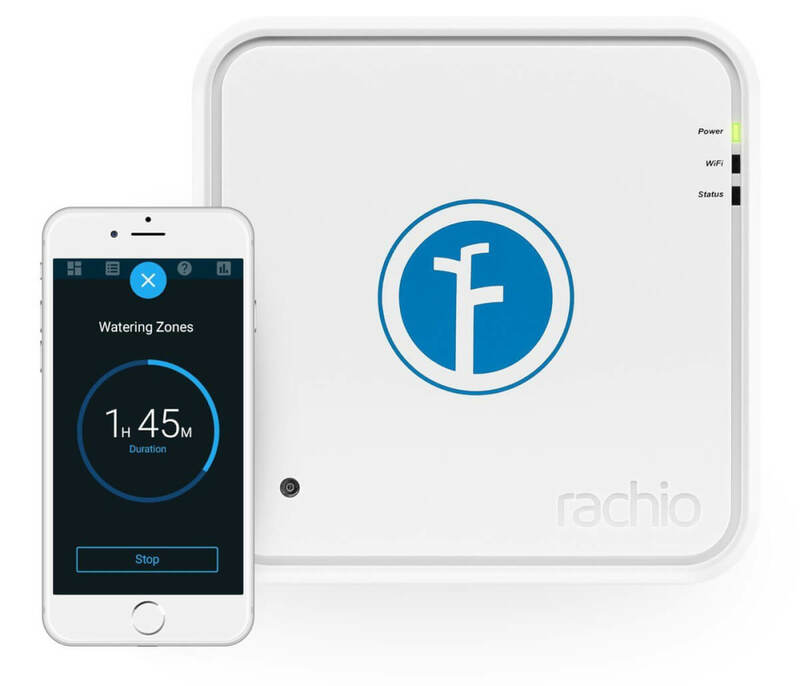 Rachio has the added benefit of Flex Scheduling, as long as it’s working correctly.. RainMachine’s big plus is that it works with Netatmo personal weather stations, and it also has a higher estimate of water savings. All devices in Rachio vs RainMachine vs Skydrop fall under the Works with Nest platform to send reports to Nest. If Nest Protect detects a fire, each controller will turn on the sprinklers. This will water your property to prevent the fire from spreading. Also works with: SmartThings, Control4, Wink, Crestron, Nexia. We tested it with SmartThings and found it easy to setup and use with our other SmartThings devices. Rachio calls itself the most connected smart sprinkler, and it’s not a lie. The device works with many smart home systems and can be automated with IFTTT triggers and Alexa or Google Home voice commands. It’s on the cutting edge for smart home integration, making it a great choice if you want to design a whole smart home system. RainMachine is a close second, but it still works with less devices than Rachio. The iOS and Android apps for Rachio vs RainMachine vs Skydrop continue to be updated and enhanced. Almost all have had updates within the last month, the exception being Rachio’s iOS app. Each company is known for strong customer service, offering live phone support 6 or 7 days per week. The controllers can be managed from within your web browser or smart phone apps, with real-time notifications of your yard’s watering patterns. You can also name zones within all of the apps, making it easier to tell them apart. If the Internet goes down, all three controllers will still work even without WiFi. They either continue their previously established schedules or enter a backup schedule designed for Internet outages. Open source code, allowing for more and more functionality down the road. If you’re a developer, you can write your own Python code for RainMachine. Offers location-specific water savings calculator on their website based on the past 365 days of weather and water usage. In other words: you can find out how much you would have saved for the past year if you had RainMachine. While Rachio does have some enticing features like offering access to other users, RainMachine just has to win this category. 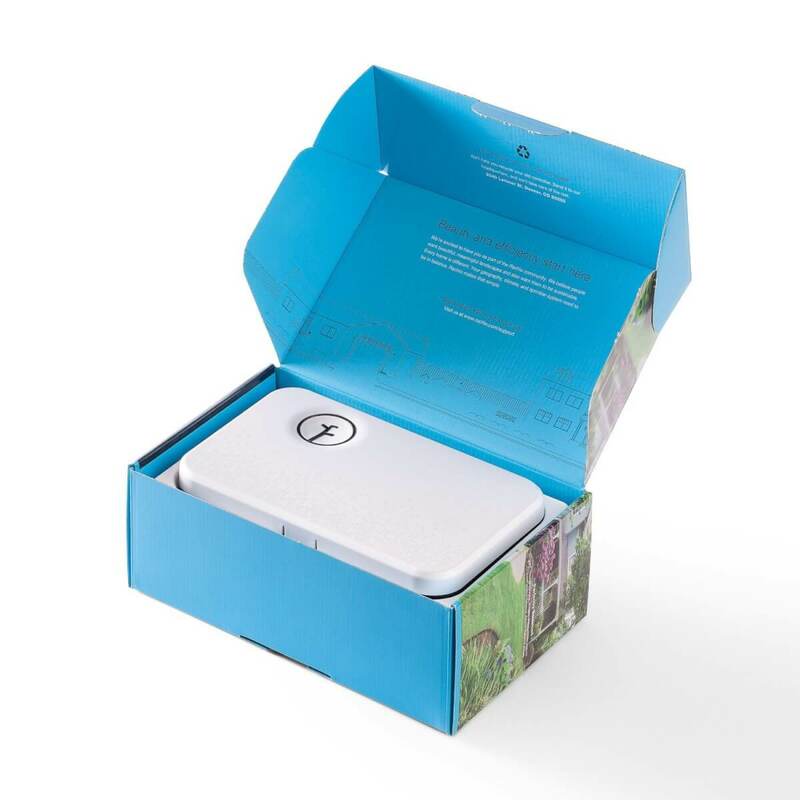 Here’s why: if Rachio goes out of business, your device is a very fancy looking brick, leaving you forced to go back to your old-school sprinkler controller. But RainMachine functions even if the WiFi is down. It stores the information, including your password, locally, making it both secure and protected in case anything ever happens to RainMachine as a company. In other words, your device will always work. The open source code also sets RainMachine apart because it shows that more functionality will be coming. We can’t ignore RainMachine’s awesome features. It is completely independent from the cloud, so you know it will always work. Its open source code makes it super smart, and it integrates with (almost) everything you would need like IFTTT and Alexa. It’s also EPA WaterSense certified and can be scheduled manually on the device to help you save cash. Rachio is a very close second place! Especially if you want a device that’s ultra easy to use and set up with other smart home gadgets. We tested Rachio hands-on and were very impressed with how reliable and easy to use it was. It is also a much better option for outdoor use. While it depends on the cloud, Rachio is a solid company and you shouldn’t have any concerns purchasing their device for controlling your sprinklers for years to come. Skydrop has similar features to Rachio and works well for many customers. It also has the lowest price tag by far, while still offering most of the advanced features you need. As they add more smart home integration and continue to update their software, Skydrop will continue to capture budget-minded customers in this market. 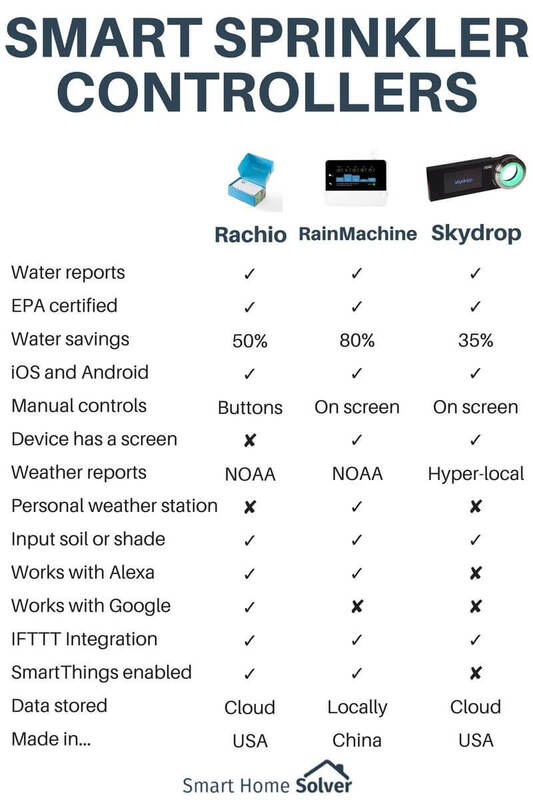 There’s your roundup of Rachio vs RainMachine vs Skydrop. For more details on devices that can work with your smart home, use our 30-second Smart Home Solver tool to see which devices work with Alexa, Google Home, and more. Editor’s Note: We originally published this in June 2016. Our writers updated it to stay current and accurate. FYI – your article is dated 30-June-2016, but Skydrop received the EPA Water Sense Certification in 2015. Just thought you may want to update your post. Thank you for pointing that out! I edited and fixed it in my post. I appreciate your help. Skydrop just integrated with IFTTT! Hey Sam! You’re totally right, I didn’t catch that! Thanks for letting me know, I just added to the blog. Skydrop’s app comes with a $6 per month fee. Thanks for letting me know that, I added to the blog. It looks like they recently added the monthly fee, that’s irritating! Hi RB, I recently talked with some of Skydrop’s staff, and they typically do not charge a $6 a month fee. They sell their system through partners and bundles who may sell Skydrop at a much lower price and then charge a fee. But for DIY set up (which most of our readers use), there is no fee whatsoever. Hi Alysa. Thanks for all the great information! But just FYI – there are customers now being charged $6 per month for the app who purchased their SkyDrop at Lowe’s (per their reviews on lowes.com). That’s as “DIY” as it gets, in my opinion. They are charged after a free “trial period”, so then it’s too late to return the product. I am currently awaiting written confirmation from SkyDrop that I will NOT be charged (before I install, because I will return it if there is a monthly app fee). Just wanted to let you know, since there seems to be a lot of conflicting info “out there” on this subject. Thank you very much for your comment! As you said, there is a LOT of conflicting info out there. I’m reaching out to Skydrop for further clarification of exactly when their $6 monthly fee is required. I will fully reply to your comment and update this blog with more details by next week. Thanks again! Hi there, I wanted to reply one more time now that I’ve followed up with Skydrop. They reiterated that anyone purchasing from a retail location should never be required to pay a monthly fee for the app. While I see the $6/month information in some of the reviews on Lowes.com, Skydrop has made it very clear to me that this monthly fee isn’t applicable for retail, self-installed options. For any questions about specific cases, they encouraged me to have you contact sales@skydrop.com. While you might not be keen to reach out to their sales team, they were actually very helpful for me in answering these questions and will definitely help clear up any misinformation that you’ve heard. Thank you again for your comment! The Rachio seems to be the only one with an optional waterproof enclosure for outdoor installation. The other two seem to be for indoor installation only. My old unit is outdoors so that is an important differentiating factor. Going to get the Rachio. Thanks for letting me know! I actually found waterproof enclosures for all 3 devices, although RainMachine can be temperamental outdoors since it has a touchscreen. I added details and links to the blog post, but I’d probably agree with you and recommend Rachio if you need to install outdoors. Thank you again for the comment! RachIO is not made in US. Hi Howd, thank you for your comment. I checked with Rachio and they informed me that the Rachio controllers are manufactured in the U.S., but the included power adapters are made in China. This may be where the confusion is coming from, but the device itself is made in America. Thanks! In my view Rainmachine seems to have an easier interface. “easy to use’. And has much better historical graphs — the relation in between weather and water use is well defined. Rachio is a good controller has nice outdoor enclosure for the ones that need to place the controller outside for both 8 or 16 valves options. Skydrop looks flashy, but I doubt the usefulness of the interface. A jog-dial? How do you type on it? Why not touch screen? If the $6/mo fee is true, nobody will buy it. Thanks for your comment. I’m glad that we both picked RainMachine as the overall winners comparing Rachio vs RainMachine. I updated our review to include the details you listed about shade/slope and WUnderground compatibility. Thank you for the corrections!